I can honestly say this is the best soup I’ve ever had! 1) Make sure the leeks have been trimmed, rinsed thoroughly and patted as dry as they can be with a paper towel. 2) Heat a large pot over medium-low heat and add the olive oil and butter. Add the leeks, salt, pepper and crushed pepper flakes and toss well to coat. Cook, stirring every few minutes, until the leeks begin to brown, about 20 to 25 minutes. Once the leeks are starting to brown, stir in the brown sugar and cook for another 10 minutes until they are super caramelized. Stir in the roasted garlic. Increase the heat slightly to medium and add the wine. Stir to combine, then cook for a few minutes until most of the wine cooks off. Pour in the stock and stir. Bring the soup to a boil, then reduce to a simmer and cook for 15 minutes. 3) Turn off the heat and carefully add the entire mixture to a blender and puree until smooth. Pour the pureed soup back in the pot and heat it over low heat. Stir in the almond milk, then tasted and add more salt and pepper if desired. 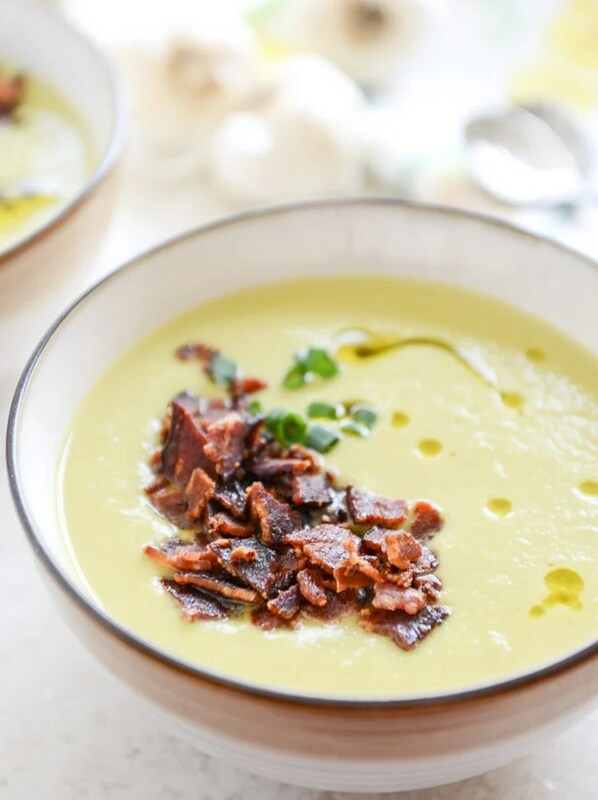 Serve the soup with a sprinkle of green onions, a drizzle of olive oil and a handful of crushed maple bacon. I found this recipe on an amazing site site called How Sweet It Is- Click here to check out her site! I made changes to render it gluten and lactose free.